It’s gonna be a huge day at Gigantic Brewing on Saturday, December 8th as the brewery will host its 2018 Holiday Craft Market and the release of MASSIVE! 2018 Small Batch Scotch Barrel Aged Barley Wine. Plus the taproom and barrel room at Gigantic will be showing the MLS Cup when the Portland Timbers take on Atlanta United for the Philip F. Anschutz Trophy at 5:00pm. Gigantic Brewing’s 2nd annual Holiday Craft Market will take place inside the brewery this year from 1:00-6:00pm. Here the brewery will host many local artists and makers that will assist in alleviating your holiday shopping. 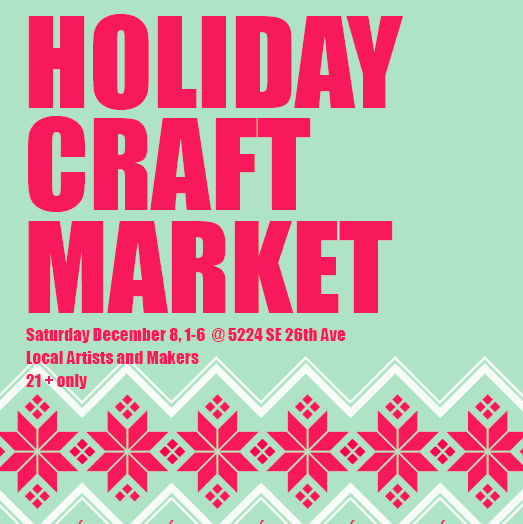 Vendors include Marshall’s Haute Sauce, Letterpress PDX, LM Inspired Jewelry, Pinky Swear Jewelry, Overcup Press, John McGloughflin ceramics, Heidi West Designs, Sweetbody Labs, Woodblock Chocolate, Adom Fashion Group and more! The brewery will also have some special Gigantic beers and discounted Gigantic merchandise as well! Also taking place on Saturday is the release of MASSIVE! 2018 Small Batch Scotch Barrel Aged Barley Wine. This limited run of only 30 cases will go on sale beginning at Noon. Gigantic will also be pouring this big beer on tap as well. MASSIVE! Scotch Barrel Aged was brewed using only British Golden Promise malt and boiled for eight hours. This long boil gives the beer a deep ruby color and rich malt flavor. Then MASSIVE! was aged in Macallan Scotch barrels for nearly two years. Enjoy the richness and intensity now, or after years and year and years more of aging. In addition to the MASSIVE 2018!, Gigantic will also be selling a limited number of cases of older vintages of MASSIVE! Bourbon Barrel Aged that includes 2016, 2017 and 2018. As a special promotion for this release Gigantic is giving a one day only 20% discount when you build your own vertical tasting and purchase a 4 pack of MASSIVE! bottles. Seattle Based Ghostfish Brewing Signs With General Distributors Inc.